Many of us have a linen garment hanging in our closets, and we usually wait for the hot summer months before dipping into this distinctly soft and breathable material. But when it comes to linen bedding, there’s more to consider! Will it keep you warm in the winter? Is its characteristically coarse texture soft enough for sleeptime? Well, there’s only one way to find out. 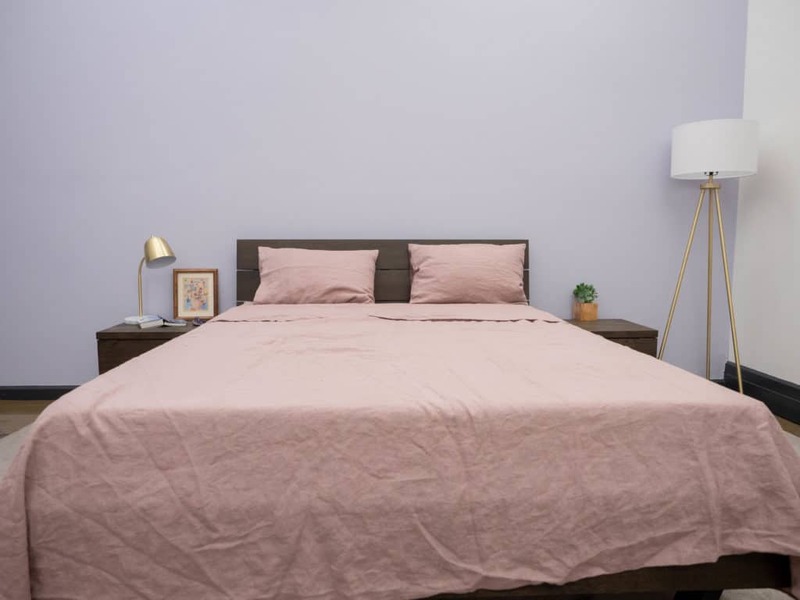 In this review, we’ll be taking a close look at the Woodrose Linen Sheet Set from MagicLinen. This sheet set is made from 100% linen and has been stone washed, so I’m going to dive into this bedding and figure out what I love, what I’m not so crazy about, and for whom these sheets might be most beneficial. No time to read the entire article? Click here to skip to my review summary. Enjoy the gently massaging, cooling caress of 100% linen sheets from MagicLinen, and save 10% on your order with the code SLEEPOPOLIS! Like I said, these sheets are made from 100% linen which is derived from natural flax fibers. So, sleeping on a fabric that’s naturally and sustainably sourced is a nice, eco-friendly perk. Unlike some linen sheets, this set is not blended with cotton or any other textile byproduct. So, these sheets do offer a distinct feel that only pure linen provides. That said, linen fibers are thicker and produce a stiffer yarn (compared to cotton, for example) so the texture of these sheets is going to feel very crisp and almost coarse in nature. At the same time, however, linen is very breathable and soft in a way that’s unique to this fabric. One of the magical things about linen (pardon the pun) is that it’s thermoregulating. Essentially, that means that the fabric adapts to your body’s temperature. If you’re warm, the linen will help wick moisture and dissipate heat; if you’re cold, it works as a great insulator. This particular set is stone washed, so it does have an extra softness factor going on. For those of you not familiar with stone washing — it’s a process used in textile manufacturing meant to give new fabrics a worn-in appearance as well as enhance their softness and flexibility. In this case, the stone washing is reducing the coarse texture of the linen a bit and creating a handfeel that makes you think these sheets are soft and smooth from years of washing. Each MagicLinen sheet set comes with one fitted sheet, one flat sheet, and two pillow cases. 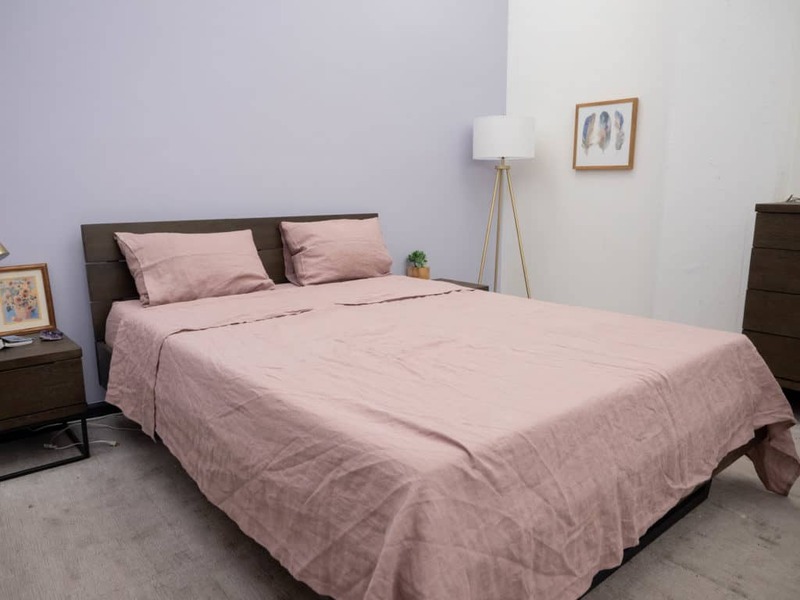 Something great about MagicLinen is that, when selecting your sheet size, you can choose from two different mattress depths. Specifically, you can choose to have your fitted sheet fit a mattress up to 10 inches, or up to 18 inches. I’m testing this set in Woodrose (which is described as a ‘dusty pink’ color), but there are many other colors and styles available. It’s all about your personal taste and what you think works best with your bedroom! However, it’s important to note that linen has a naturally wrinkly nature that creates a causal, lived-in look that contributes to the distinct aesthetic of pure linen. For those of you who already know what pure linen feels like, you’re at a little bit of an advantage here! I say that because linen is a fabric that’s got a very distinct, unique feel that can almost sound a little contradictory when described. It’s very soft, but also coarse. It’s light and breathable, but also constructed from a thicker yarn. It can cool you down, or warm you up. Linen has a pretty multifaceted personality! When it comes to this particular set, however, the stone washing does bring a softer, more comfy element to the table. Some folks might get a little confused when I say that the texture of these sheets is “coarse,” and assume that I’m saying it’s not soft. It is both, if that makes sense. The thick linen fibers creates a stiffer yarn which produces a rougher texture that has a gently massaging quality. Meanwhile, the stone washing process enhances the smoothness which, in my opinion, sets these sheets apart from other linen bedding I’ve felt. While there is the option to have your fitted sheet accommodate mattresses up to 18 inches deep, I chose the 10 inch option. Although, I was definitely pleased to be given the choice! Being able to order your fitted sheet with extra deep pockets is always a perk. Using the 10 inch fitted sheet, though, was perfect for me because I was working with a mattress that is 10 inches deep. So, the fitted sheet fit the mattress like a glove — closely adhering to the edges and remaining tightly tucked. It’s worth noting that the pillow cases are a little smaller than I’m used to, and they did squeeze my standard size pillows a little bit. 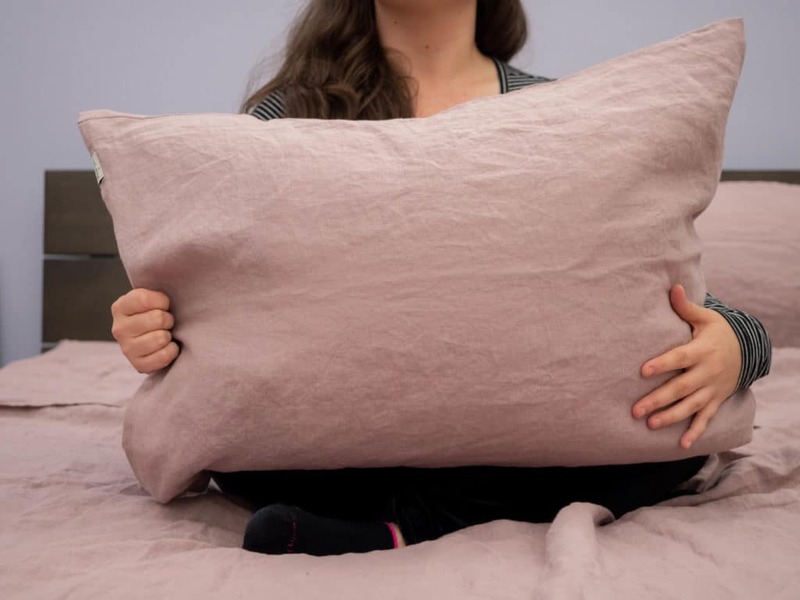 Frankly, I didn’t mind and it actually served to keep my pillows pretty perky, but it was definitely a change from most of the standard/queen size pillowcases I’ve tested which are generally quite large. Simply put, I found these sheets to offer a multifaceted combination of traits that offers a uniquely balanced feel! They are soft and smooth from the stone washing, but rough and coarsely textured because they’re 100% linen. They feel very breathable, but also have a thicker fiber that feels a little heavier than cotton. As usual, the only way to really know how they perform is to take them to bed and see for myself! The first thing I noticed about these sheets is how pretty the color is. The Woodrose pink is not a color I have seen very often, and I do like to add a little flare to my bedding every now and then! I always say that white cotton sheets are a bedroom essential (and they are), but it’s also nice to switch it up once in a while. As I dressed my mattress with these sheets, my first impressions were that they are obviously very breathable. Fanning the top sheet over the bed offered this really luxurious drape and whooshing noise that roused a little sleeper excitement in me. I’m typically a pretty warm (and sweaty) sleeper, so I was pleased to see how well the air seemed to flow through the fabric. The next thing I noticed was that the stone washing gives them a very smooth softness that I wasn’t expecting. I have some linen clothing, and I am familiar with the coarse, skin-massaging nature of the material. But because of the stone washing process, these sheets have a smoother handfeel that I thought was quite nice (and surprising!). Don’t get me wrong — these sheets still definitely feel like linen. But they’ve got a cozy, worn-in feel that makes you think they’ve gotten softer and softer after years of washing. Something I do love about these sheets is they are less noisy than any sheets I’ve ever tested. There was no swishing, crumpling, or crinkling of any kind as I rolled around in bed; and as a very light sleeper, that’s important to me. But just remember: these sheets do not feel like cotton. At all. They have the distinct feel of linen which, as I said, is going to feel a little rougher in texture. After rolling around in these sheets, I felt that they were temperature-neutral. I didn’t feel like I was being warmed up under a heavy fabric, and the breathability offered a pleasant feeling that was more breezy than cooling. That being said, I do associate the feel of linen with warmer weather and might swap these out for some cozy flannel sheets once the winter rolls in. Overall, I feel like lovers of linen are going to appreciate these sheets the most. They really offer that coarse texture and lived-in look that is characteristic of linen, and they are very soft and breathable too. But the stone washed quality of these sheets does add a bit of an ‘X’ factor that sets these apart from most of the linen bedding I’ve enjoyed. I think that folks who aren’t too sure about linen sheets but are curious to try might want to start with these! Worn-In Aesthetic — Not everyone is going to love the lived-in, casually creased nature of these sheets. It’s definitely part of the personality of linen, and you kind of either love it or you don’t. Personally, I think offers a kind of rustic, relaxed aesthetic; but it’s not for everybody, so keep that in mind. Coarse Texture — Another thing to remember is that while these sheets are soft (and even softer than other linen sheets I’ve felt), they don’t feel like cotton at all. They offer a different kind of textured softness that’s less smooth and silky and more coarse and breathable. So, for folks who are mostly familiar with cotton sheets, it’s important to note that these have a different feel. No Trial Period — Unfortunately, there is no trial period available for these sheets. Oftentimes, a company will offer a trial period so that you can get the sense of the bedding before fully committing it to your bedroom. But, there is no way to test MagicLinen sheets before buying them. 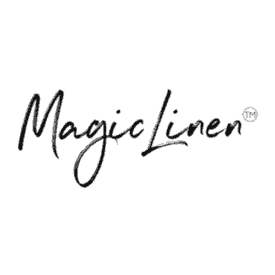 However, the folks at MagicLinen have said that they are considering adding a trial period in the future. Goes Green — These sheets are made from 100% linen which is hypoallergenic and harvested from a natural, sustainable source. 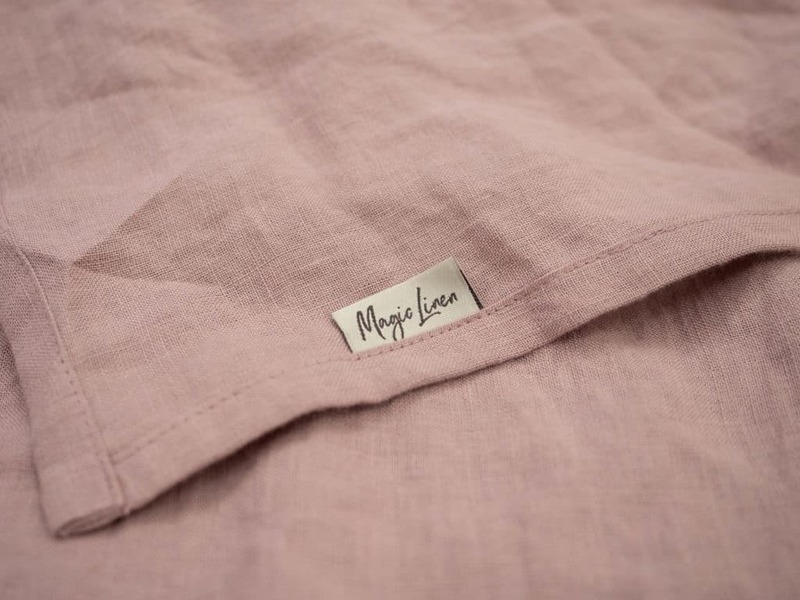 Linen is also very breathable and moisture wicking, so it doesn’t accumulate germs as easily. So, if you’re looking for bedding that’s going to be easy on both your skin and the environment — you might want to give these a try. Likes A Stone Wash — The stone washed softness going on here adds a layer of comfort that I don’t always feel with linen. Linen sheets do generally have a coarser texture than cotton, but the stone washing makes these really soft and cozy. So, while they still have that distinct linen feel, they are softer than you might expect. Customizable Comfort — Something awesome about MagicLinen is they offer custom size bedding. 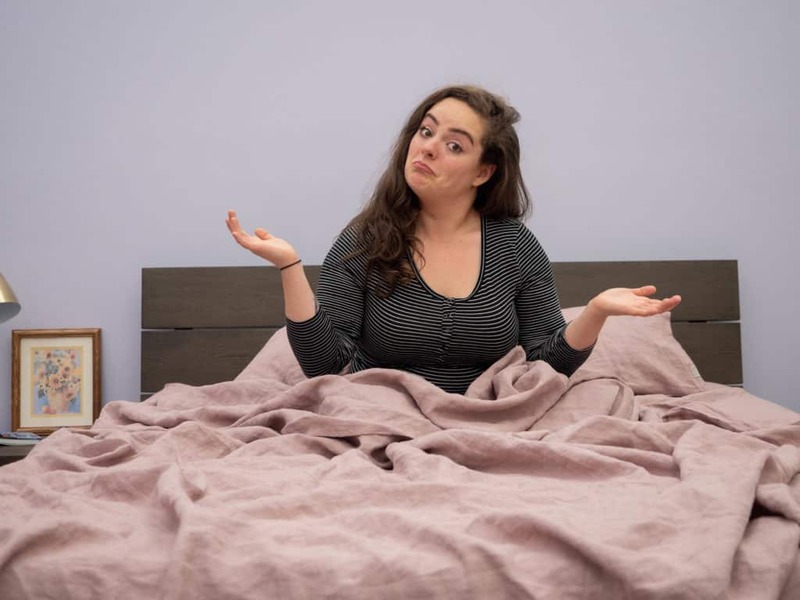 So, in addition to being able to choose two different mattress depths for your sheets, you can also get most of these sheet sets customized to your preferred dimensions. 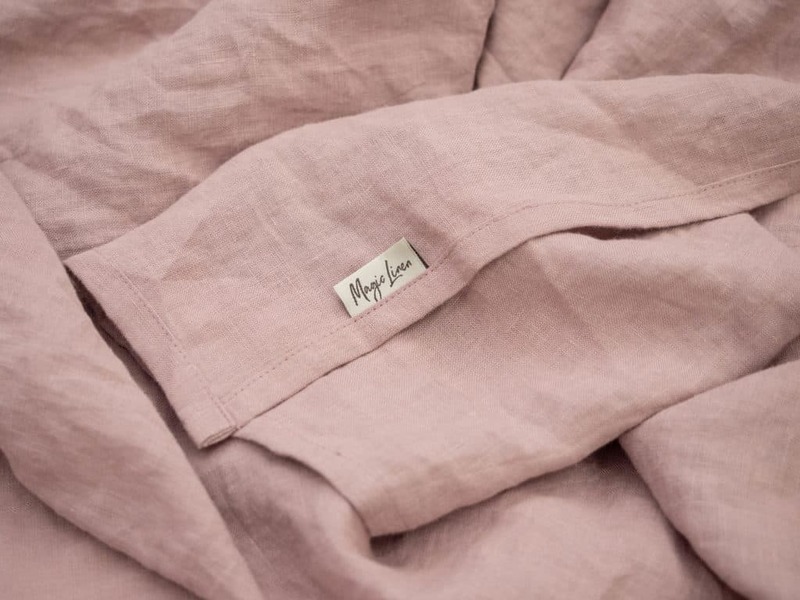 Shipping and Returns — Most MagicLinen items are made-to-order and take between 3-7 business days to make. After the item is finished, it is sent via either standard or express shipping, depending on your request. Returns are accepted for unworn, unused, unwashed items and have to be processed within 5 business days after delivery. Custom orders, unfortunately, can not be returned. The return expenses have to be covered by the customer unless the company agrees that the product was defective. Sizing — Sizes range from twin to king, however sleepers are able to customize sheet sets according to their preferred dimensions. Sleepers may also mix and match pillowcase sizes. Care Instructions — Machine wash on a gentle cycle with mild detergent, and tumble dry on low heat. 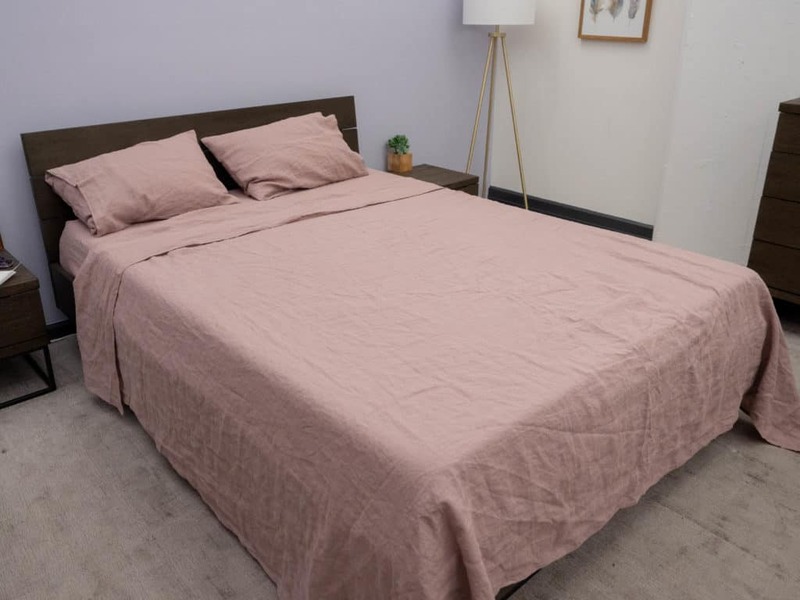 This set is stone washed, so they are designed to get softer with every wash.
Get your new bedding from MagicLinen today!